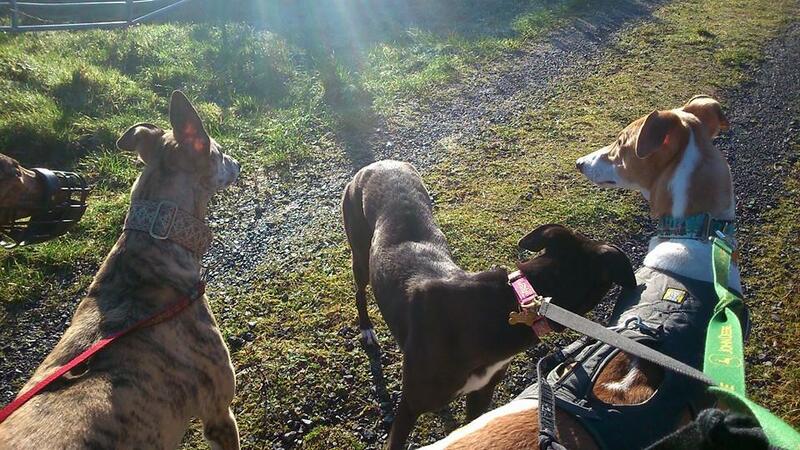 Recently there has been a lot of interest in greyhounds who can live successfully with cats, so we had some special guests in January for the Extreme Kitty Bootcamp Weekend! 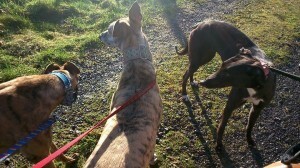 Clare from HUG travelled from Co Kerry to visit with two lovely brindles, Xena and Buster, to see if one or both might be suitable for cat training. With Ru and Robyn here as well, it was a very full house! 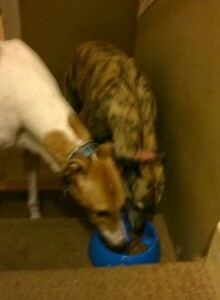 We introduced the two new dogs carefully to Pea, both wearing muzzles and leashes, to gauge their initial reactions. Penny disappeared upstairs, far too many dogs in one room for her! Xena was very calm right from the start, showing little interest in the cats and more focused on looking for human cuddles. 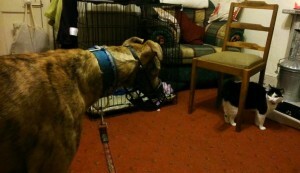 Buster was a bit more curious about the cats, so we put him in a crate to observe them from a safe distance. He showed no aggression towards them, and it is natural for a dog who has never seen a cat before to show a certain amount of curiousity, so it didn’t rule him out by any means. Since we were lucky to have a sunny day, we took all four dogs for a walk in the countryside to give the cats a break from so many canines in their domain. It is also good to give the dogs some exercise so they are a little bit tired and more relaxed when to return to the house and the kitties. 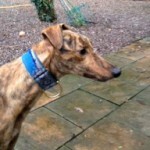 If they proved cat trainable, one of the two brindles was going to go to a home in Ireland that was looking for a cat friendly hound who would also be suitable to live with children. Since Xena showed immediate promise with the cats, she was chosen for the Irish home, however both were lovely dogs, very friendly, calm and well behaved. Buster is now going to a home in Finland where he will continue his cat training. Due to transport logistics, it made sense for Xena to stay here with us for the following week, so we could deliver her to her new family as part of another journey. 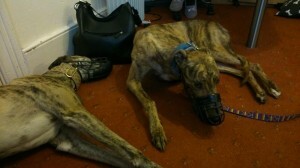 Clare took Robyn and Buster back down Kerry to await their further travels to Belgium and Finland respectively. Dog rescue requires a lot of juggling, especially when hounds are traveling long distances to find their new homes! Xena made herself at home very quickly, a very easy going girl who was good buddies with Ru, even sharing the same food bowl at mealtimes. 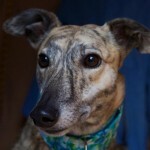 She has very striking markings, a rare light lemon brindle and big dark eyes, so she turned heads wherever she went. It was also good to continue her cat training for another week, though she didn’t disappoint, studiously ignoring the cats wherever they went. 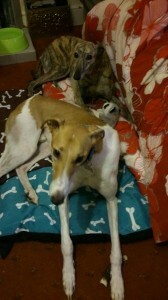 She has settled very well into her new home, with a smiley face and tail wag for every person she meets.